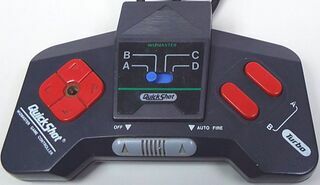 The WizMaster is a third-party controller manufactured by QuickShot. Among various computers, the controller is compatible with the Sega Master System. The controller has turbo options, and like early versions of the Master System pad, a hole in the centre of the D-Pad for a thumbstick. The centre section of the unit is interchangeable, allowing the controller to work with different consoles (notably the Nintendo Entertainment System).